Are you a huge fan of thinking outside the cross stitch square. Do you love the idea of taking a cross stitch to the next level? You are not alone in this thought process. There are so many people are taking everyday objects and adding cross stitch elements to the mix. There are also those who upcycle old cross stitch pieces into new projects. These projects are so inspiring. Below are just a few samples of cross stitchers who have thought outside the "X" and brought new life into worn out pieces. One of the easiest ways to add cross stitch elements into everyday life is to upcycle that old dining room table chair. How many of us have those 1980's style rattan dining room chairs in our garage. We haven't had the heart to throw them out. 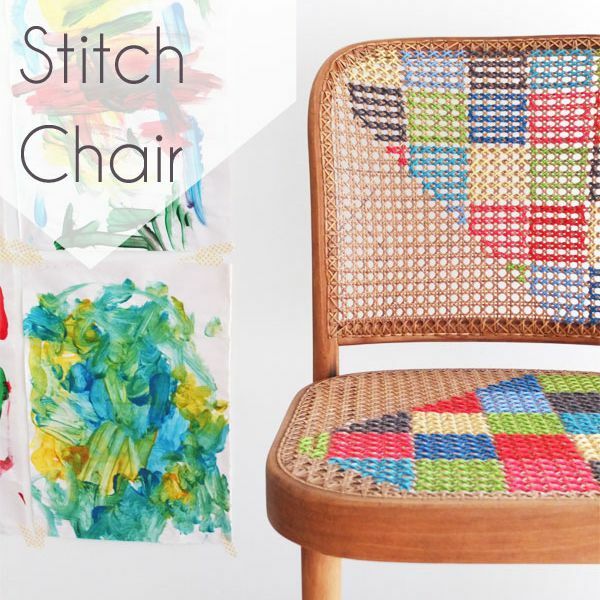 By themselves, they are outdated and to be honest, quite ugly, but add some cross stitch and you have a one of a kind chair that brings color and style to your home. My Poppet Makes has the best tutorial out there for cross stitching on a chair. She has easy to follow step-by-step instructions with detailed pictures. This project can be used on a chair or rocking chair. You can also use it anything wicker related. What not try to cross stitch an entire sofa! Once you get the idea down, you can add your own patterns to the chair. Another way to upcycle pieces with a cross stitch element is to add some flair to your office supplies. You can take a mesh mail holder or pen holder and stitch a cute pattern onto. Again, think outside the square! You have the basic cloth pattern, now just get some yarn or floss and start to get to stitching. Monogram office supplies for the new grad or dad! It is the perfect gift. This is a great way to dress up your office or dorm room. It also is great for teachers. You can teach cross stitch to kids of all ages with this idea. They will learn a craft and take home something useful. Do you collect vintage linens and cross stitch? Don't you absolutely love seeing how everyday life unfolded in the past? It is true that everyday items can give us a real history of our world. Unfortunately, some of the cross stitch pieces that are around, look like they have been put through a lot of wear and tear.You can still buy the fabric or project and repurpose it. One way to save a cross stitch is to repurpose it to something else like curtains, a purse or even a new wall piece to hang up. Pillows are always an excellent way to save a cross stitch. You can piece several patterns together to create a blanket or reupholster a chair. You can cut out the cross stitch from the rest of the fabric and with fabric stiffener create jewelry or hair accessories. Check out Pinterest for ideas. There are members that have whole boards dedicated to preserving and repurposing old cross stitch. Repurposing and thinking outside the box is an excellent way to spread the word about cross stitch. It shows the non cross stitching world that it is not just little ducks and bonnet girls.Show them that cross stitch is hip and still relevant and even though granny did a years ago, it has come a long way. There are so many different ideas and we are only at the tip of the iceberg. If you can drill a hole in it, it can be stitched. Don't settle for boring. Cross stitch an entire room or even a house! So, grab your floss and needle and breathe life into that old project. Use that "X" to think outside the square.